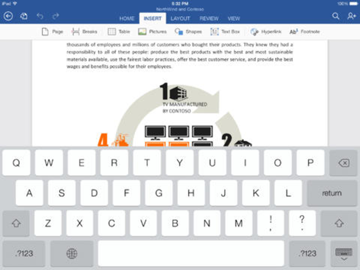 Microsoft Word for iPad, Microsoft Excel for iPad and Microsoft PowerPoint for iPad are all available as free downloads. 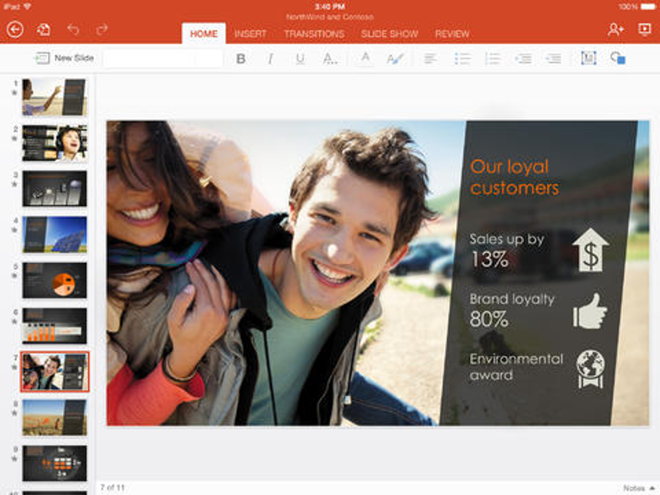 Users can view documents for free with the software, but require a subscription to Office 365 in order to make edits. Images, tables, charts, SmartArt, footnotes, equations are all there, nicely formatted. 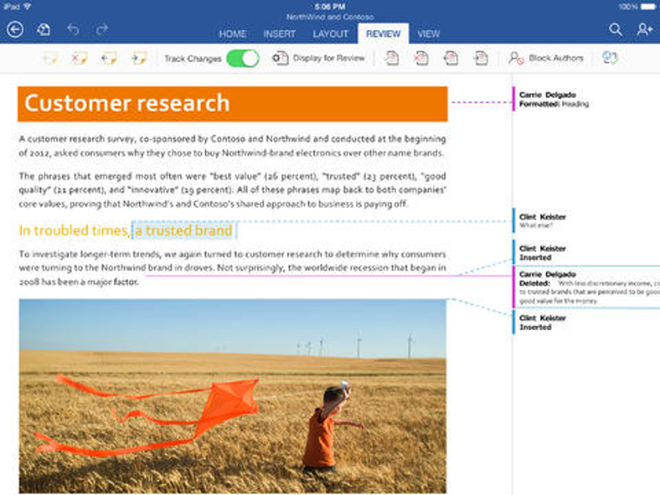 Word documents look great, just as they do on your PC or Mac. View email attachments and access all your Word documents from OneDrive, OneDrive for Business, or SharePoint. Pick up from where you left off because Word for iPad knows what you were working on last, no matter what device you were using. When you edit a document, your content and formatting are maintained across all your devices - PC, Mac, tablet and phone. Express your ideas exactly the way you want, with rich formatting including fonts, pictures, tables, charts, textboxes, shapes, footnotes, page layout and more. Track changes, add comments and work simultaneously with others on the same document. 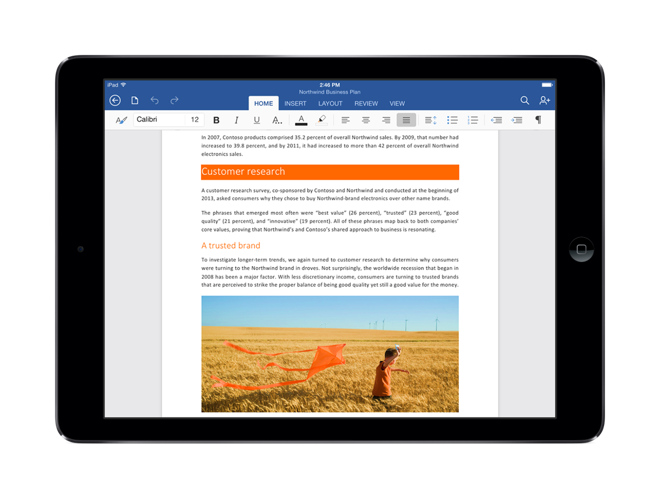 Word automatically saves your document, so you can rest assured that you don't lose all your work while you're on the go. It's easy to pick up the app and get started, because it's like the Word experience you already know. Formulas, tables, charts, comments, hyperlinks, sparklines, conditional formatting are all there, so you see the whole picture. 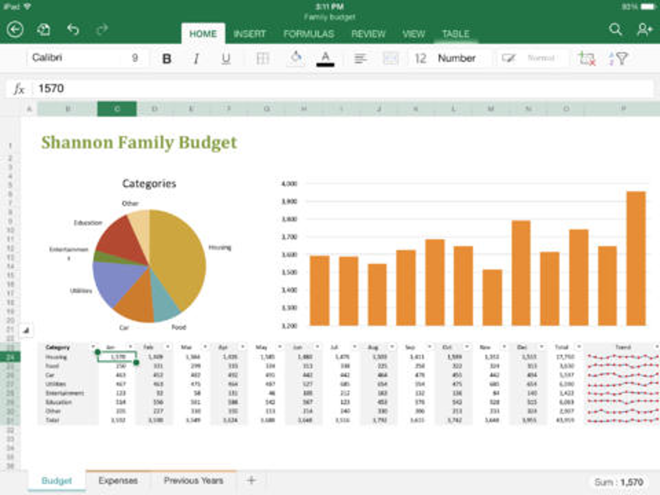 Excel spreadsheets look great, just as they do on your PC or Mac. View email attachments and access all your Excel spreadsheets from OneDrive, OneDrive for Business, or SharePoint. 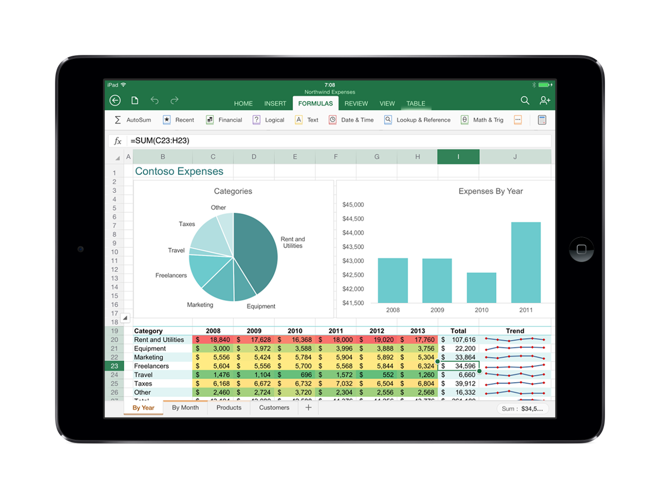 Pick up from where you left off because Excel for iPad knows what you were working on last, no matter what device you were using. When you edit a spreadsheet, your content and formatting are maintained across all your devices - PC, Mac, tablet and phone. A special formula keyboard lets you add numbers and formulas rapidly - much easier than with the standard touch keyboard. 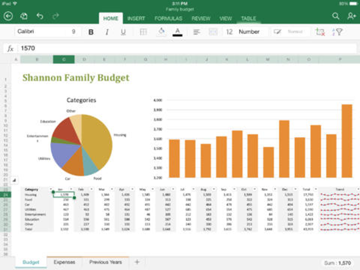 Excel automatically saves your spreadsheet, so you can rest assured that you don't lose all your work while you're on the go. Simply share your work with others by emailing a hyperlink or the entire spreadsheet. 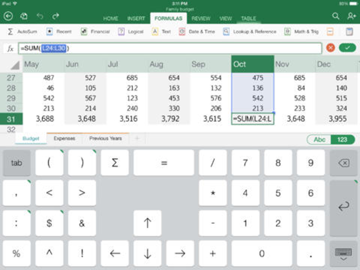 It's easy to pick up the app and get started, because it's like the Excel experience you already know. 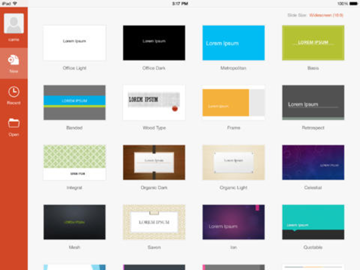 PowerPoint presentation look great, just as they do on your PC or Mac. PowerPoint automatically saves your presentation, so you can rest assured that you don't lose all your work while you're on the go. It's easy to pick up the app and get started, because it's like the PowerPoint experience you already know. 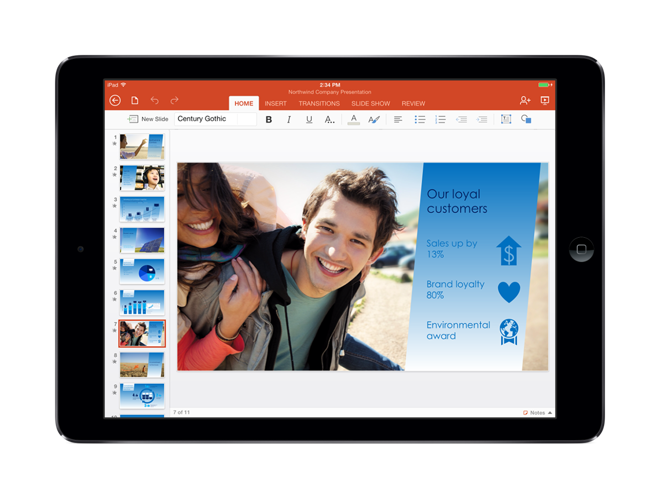 Those who don't have a subscription can buy Office 365 Home from within any of the free applications on iPad. Office 365 Home also includes up-to-date versions of Office for up to 5 PCs or Macs and 5 mobile devices, plus an additional 20 gigabytes of OneDrive cloud storage, and Skype world minutes where available. Office 365 subscriptions made through the iPad applications are in-app purchases charged through Apple's iTunes account. Subscriptions will automatically renew 24 hours prior to the end of the current subscription period, unless auto-renew is disabled beforehand.